“When I have my sale I will be buying YOUR signs.” ~ Julie Hogan, Blaine, MN. “Definitely will be purchasing these instead of making homemade signs! That is awesome! ~ Laura Roberts, Kerman, CA. ​LynnVision, Inc., a Hi Octane Corporation, is certified from WBENC (Women's Business Enterprise National Council) as a Women Owned business. Our products proudly display the "Women Owned" logo that was created by WBENC and Walmart. 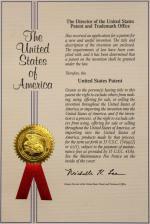 Our product, ARROWSigns received patent number 8,904,685 in December 2014. At LynnVision, Inc. it is important to us to make our products here in the USA. Knowing our products have generated jobs for those in need is an incredibe feeling. Because LynnVision cares about our landfills, we have designed our products to be merchandised without the waste and expense of packaging. Our products are 100% recyclable.